I’m really grateful to Leica Camera for issuing me the first Q2 in China last Thursday night (they had someone deliver it to me at 10pm local time - I guess to match the global launch events). Leica releases new “full” models (as opposed to their “P”, and many custom finish and packaging versions) only every 4-5 years, so it’s always a major event in the photography world, and something I’d been looking forward ever since hearing about it at Leica Rumors. I’ve used a Q (and recently a Q-P) as part of my regular setup along with my M’s since it was launched back in June 2015, as it is a great backup/complement to an M. Although cheaper than a Summilux-M 28mm lens, it still has a great f/1.7 lens, a light but solid magnesium-alloy body, fast auto-focus, and macro functionality. The EVF and real focus ring also allow for precise manual focusing. The Q2 now improves on the original in many ways: higher sensor resolution (47.3 megapixels vs the original 24) - which allows for “digital focal length” (in-body crop) options of 35mm, 50mm, & 75mm, a much longer battery life (it uses the same very nice quick-release battery as the SL), weather-proofing (though my Q survived 45 deg C in the Afar Desert to minus 25 deg C in Vladivostok even without this), ISO 50-50000 (the Q had a base of 100), 10 fps, and a much clearer OLED EVF. My favorite fix is the removal of the C-Continuous shooting mode from the power-on/shutter release - I can’t tell you the number of times on the Q I accidentally had it set to C instead of S-Single mode, and ended up with numerous duplicate shots! Another great fix is the diopter-correction knob next to the EVF is now recessed, so that it won’t easily be accidentally nudged - which happened a lot with the Q in my case, requiring almost daily adjustments. Over the past few years I’ve become more and more fascinated by how the urban environment at night is so representative of the human presence on this planet. It is our cities - the structures, the colorful electric illumination, the vehicles that transport us within them, the noise and activities that provide the lifeblood - that encapsulate so succinctly what it means to be human in the 21st century. In comparison I find daytime photography, at least in the typically overcast cities I live in, to be woefully pallid and uninteresting. Perhaps my recurring interest in this theme is also partly due to the fact that I prefer going on photowalks at night - when the weather is cooler, and when I can allow myself to be more in the present, and less distracted by my other duties and responsibilities - when it is easy just to lose myself in the rhythm of the living city (especially after a few drams of decent whisky). So it’s been some time since my last travel blog post. Mea culpa. It has been a very busy time for me and my family, and updating this blog just got edged out by other events. Negative ones: an uncle getting cancer, battling and clearing it twice, and then sadly succumbing to after the second recurrence; an aunty also getting cancer, and then succumbing after a year. Positive ones: my wife recovering from a malignant tumor; and amazingly, our first pregnancy and the birth of our first child (! ); we’ve been trying to commute/move between two cities; and I’ve gotten involved with a new health and wellness project in Hong Kong. It was therefore a great suggestion by my wife that we take advantage of the Chinese New Year holidays last month to have our first proper family vacation in a long while, and we decided to go to Bali, where she had never been before, and I hadn’t been in over 5 years. With our 4 and a half month old baby! To cut a long story short, we had a wonderful time - I still highly, highly recommend the place, despite the terrible traffic and some pollution along the beaches close to Kuta. Somehow it is still the one place in all the world that for me is a perfect combination of natural beauty, spirituality, great food, and most recently, a Mecca for healthy living. We were there for just under a week, and split our time between Ubud at the center of the island, and Seminyak, one of the most popular beach areas on the western coast. In Ubud we stayed at the Como Shambhala, an older property but still magnificent if only for its location in the heart of the tropical forest and the amazing breakfasts, and in Seminyak we put up at The Legian - again an older property, but with a great location and good service. The following are a few of the photos I took while on this trip - some are with an Leica M10-P (with Summilux 35mm/50mm) and some are with a Leica Q-P. I was walking along Seminyak beach at sunset one evening when I encountered this group of boys playing soccer with an old ball. Bali, Indonesia. © Jonshe 2019. A snapshot of my wife taken at the natural hot spring on the grounds of the Como Shambhala. Bali, Indonesia. © Jonshe 2019. A photo of a local jungle resident nursing her beautiful infant. Bali, Indonesia. © Jonshe 2019. A photo of a white-water rafting boat taken from the grounds of the Como Shambhala Estate. Bali, Indonesia. © Jonshe 2019. An early morning worker on the grounds of the Como Shambhala Estate. Bali, Indonesia. © Jonshe 2019. My wife and I really enjoyed the beautiful tropical forest within the grounds of the Como Shambhala Estate. Bali, Indonesia. © Jonshe 2019. An early morning gardener on the grounds of the Como Shambhala Estate. Bali, Indonesia. © Jonshe 2019. A family snapshot at The Legian. Bali, Indonesia. © Jonshe 2019. A snapshot of my son lounging on our deck at the Como Shambhala Estate. Bali, Indonesia. © Jonshe 2019. While this series name suggests, Bali is a very real “paradise” island, one significant area of weakness is its beaches. Decades of tourism by thousands of tourists every day have resulted in one of the dirtiest beaches I’ve personally visited. So much so that on a daily basis many of the hotels arrange for bulldozers (land movers) to move the garbage off their beachfronts! For this somewhat surreal image of two vacationing ladies floating in a luxurious pool just meters away from a trio of industrial machinery working to create an artificially pristine beach I looked to Martin Parr’s work for inspiration. The Legian, Bali, Indonesia. © Jonshe 2019. 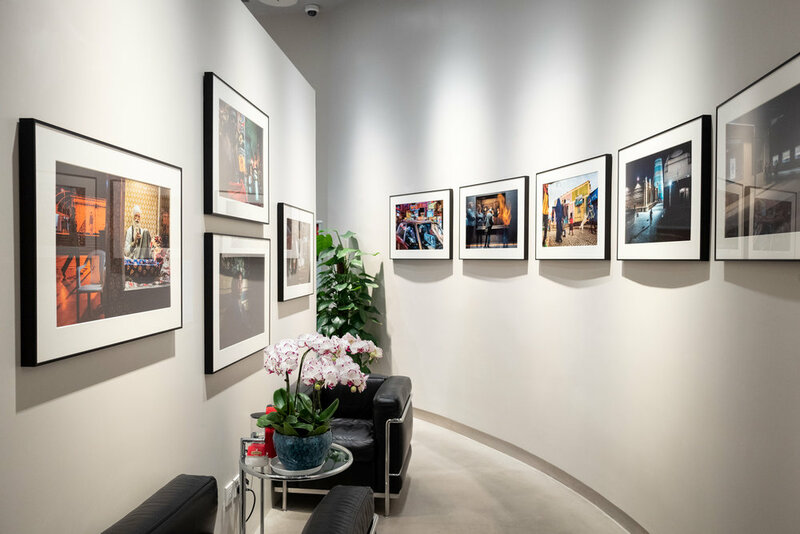 If you happen to be in Shanghai, you might be interested in checking out my solo exhibition at the Leica Store in Xintiandi, which has been showing since last November. Not quite sure how long more it will be up for though! Here’re some of images from the opening and the small workshop I ran at the Capella Hotel. The small gallery within the Leica China flagship store at Xintiandi. Shanghai, China. © Jonshe 2018. Opening cocktails at my solo exhibition at the Leica Store Gallery in Shanghai, graced by His Excellency Axel Cruau the French Consul-General and his wife Dourene, Mr Siegmund Dukek the Managing Director of Leica China, and Ms Rosalyn Luo Zilin, Miss China Universe 2011. Shanghai, China. © Jonshe 2018. Simultaneously with my exhibition at Leica Shanghai I ran a short workshop at the Capella Hotel. Many thanks to the great participants! 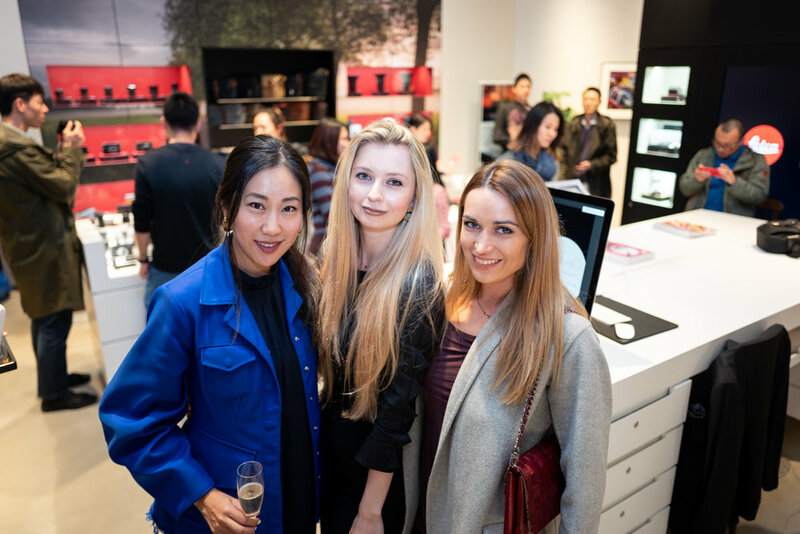 Some of the attendees at the opening of my small exhibition at Leica Shanghai. Shanghai, China. © Jonshe 2018. Leica desserts at the opening of my small exhibition at Leica Shanghai. Shanghai, China. © Jonshe 2018. “Industry Wefie”. This image was taken during a Social Media industry event hosted by Inside@Retail in Hong Kong earlier this year, of a now obligatory “wefie”, this one of local industry insiders including Anson Bailey (KPMG), Arthur Yuen (Facebook), Nathania Christy (TrendWatching), Marina Bay (BeFast Media), Rita Simonetta (Sands Macau), and Kathryn Lui (Isobar). Hong Kong, China. © Jonshe 2018. #jonshe #ourstreets #hikaricreative #lensculture #burnmagazine #spicollective #lfimagazine #photojournalism #life_is_street #jonshe #magnumphotos #documentaryphotography #35mmstreetphotography #tableaux #agameoftones #ig_street #capturestreets #urbanandstreet #leica #leicacamera #hkig #reframinghk #socialmedia #WeChat #佘伟彦 #wechatxleica Inside Retail Hong Kong Retail Social Media Masterclass August 28 2018. Last Saturday we decided to make the best of a wet (and very cold) day by visiting a place that we'd never been before - Tai O Fishing Village on Lantau Island. From the Ferry Terminal in Central (Pier 6) it takes about 20 minutes to get to Mui Wo on the island (via the "Fast" Ferry), and then it's another 30 minutes or so to Tai O, by bus. While not large (you can probably walk from one end of the village to the other, as the crow flies, in about 15 minutes), one could spend an entire day here, as it is laid out as a small maze of interconnected streets and what look like temporary lanes, filled with many small retail shops and an even larger number of street food stores, which seem to be what most of the local visitors to Tai O come for. Be prepared therefore for long queues for the "best" waffle shop in the village, or the "best" donut shop, or the "best" omelette shop, etc. To be brutally honest, we found most of the above food items mediocre at best, but I suppose if you wait 15 minutes for anything it tastes pretty good by default! The one thing we did enjoy (or at least I did) was the barbecued dried seafood items, especially the drilled (dried) puffer fish. In line with this theme of dried seafood items, there are many, many stores here that sell the countless varieties of this - dried oysters, dried scallops, dried fish bladders, dried fish skin, etc, etc ad nauseam. Prices are frankly not much cheaper (if at all) than at the stores in Wanchai, but there is certainly a much larger range of items. I think what we found most interesting was the opportunity to observe the local residents going about their regular activities - one of the most common of which were the mahjong games that one can observe through many of the open doorways. All in all we thought it was an interesting outing, and we'll probably visit again sometime soon, perhaps when the weather gets better!